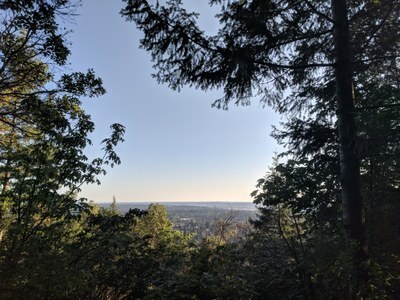 A hike at Cougar Mountain with a view. The trail was overall very well maintained. The trail at times, particularly around the vicinity of De Leo Wall, had fewer signs marking the trail than most areas of the park. Near De Leo Wall there were very short and steep sections which are easy to lose ones footing on though taking those slow and having poles helps. Be sure to take a map given the number of intersections and Cougar Mountain. At the time of the hike parking was no issue (be sure to remove all valuables from your car). Driving conditions, other than traffic, are also easy. The hike itself was quite nice. In the forest it could get quite hot and humid in comparison to the surrounding area. The view from De Leo Wall was quite nice (see picture). We also stopped at a meadow restoration area at the park which had a lot of information about the native flora and fauna.